I spent the whole day trying to come up with a prototype topology that will meet just about all of my facial modelling needs. I made my wife make all kinds fo faces and took photographs. I studies those, alongside photographs of men, women, old people…etc, with different types of expressions. I also used a bunch of pictures of wire meshs that I thought had pretty good topology for reference too. In the end, I think I got a topology that is the most versatile for different expressions, age groups, and makes the most sense. The black is the simple base topology. The green is the more detailed splits. If anyone’s got suggestions, I’d love to hear it before I start modelling it. if you are working from just the pictures, be sure to have as many views as you can get your hands on - ie. front, side, and top which should help quite a bit, and a perspective kinda view is also good to have. Yep, I put my wife through hell for my 3D. I took pics from all different angles. Here’s another attempt to see if I could do a better one. I like the first one more. I don’t believe that there is one generic topology to rule them all… or at least that there should be one. Differences in the proportions of facial features and the forms of them will break such generic loops from time to time and will cause problems; you either have to throw out the generic approach that you’ve spent so much time on, or you’ll try to force shapes and forms on a topology that cannot really support them. There are some tendencies and the facial musculature and underlying bone structure is anatomically very similar for every human; but it’s not close enough IMHO. Loops will start to drift away on the surface and loose their perpendicularity/paralelity with the slopes and tension lines of the surface quickly. I agree however that one might be able to spare some modeling time by building a lowres generic head to start from, instead of going back to a box from time to time. But, this way you’ll start to forget things and will have to re-learn many things when you are inevitably forced to start from skratch - like, for instance, when you want to model a dragon or a lion, and you’ve got used to have a base mesh to build upon. I see some problem areas - just I perceive them as problems, it may not be that at all. such as the tri in between eyebrows and the extra grey line above the spherical shape of the nose. In fact! 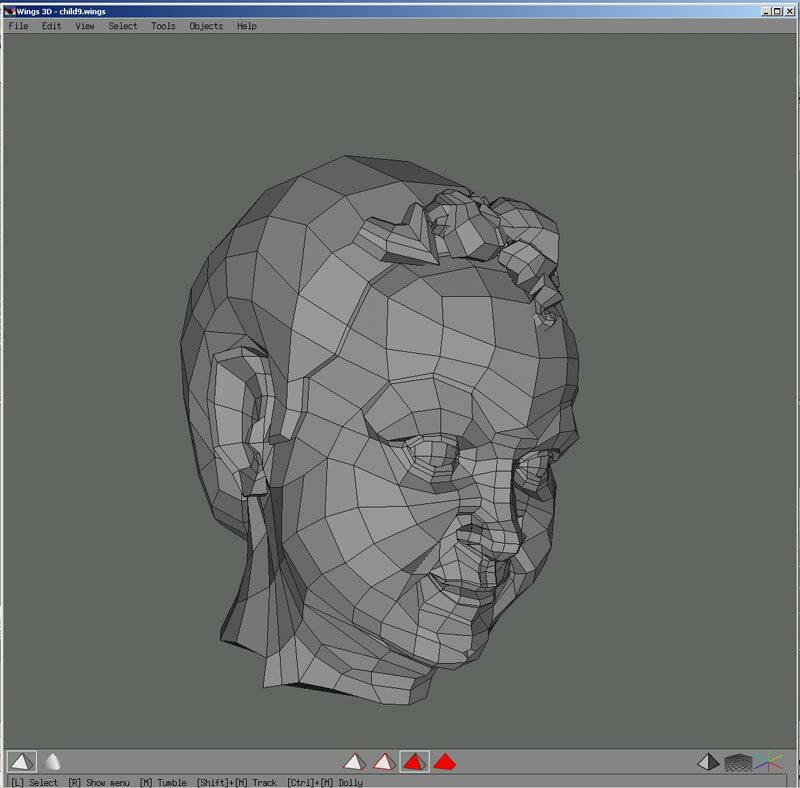 I could be wrong, but if you have a face on a model with for example 15 vertices, it after subdivision it looks like that. So in my mind you are working with non quads. also under the ear, I think that is an area not accounted for? I agree with Mr. Vargas that the loop distance and shape definitely - without a doubt - differs with each person. However, even if you start from scratch, having a “game plan” will eliminate a lot of guesswork and stress later on. Did you draw those lines on a different layer, Luna? I think it would help to see those lines separately and try to visualize it in your mind. This way you can see if that structure actually looks like your wife - you’d have to do that with each expression But if you have to take more pictures, I think she’ll keep to one expression - the I’m gonna Kill you!!! face. IMO it’s bad to reinvent the wheel every time you need a new face, good point about needing to keep practising but there are other ways to do that. Humans are genetically similar to 99.97 percent or something like that. Yes the lines in the face look different, but we all have the same underlying topology, the potential for those lines. It’s like lines in the hands of our palms, all slightly different but basically very similar - for instance you’ll never see someone with the lines going in the opposite direction, from the thumb to the pinkie. This is my fourth generation topology. I’ve spent a lot of research time on it, it’s a big improvement on the last version; it seems to work very well so far. I’ve marked in red some important areas - the wrinkles at the corner of the eyes are very hard to get right if the topology is wrong. The big nasolabial fold is tricky because on some people it connects a little higher on the chin in the smile, but I think I got a good average placement here, I think you got that pretty close too Luny. The little wrinkle at the corner of the mouth is sometimes overlooked. In many old people it does seem to cross the nasolabial fold like that. The bridge of the nose actually displays this surface shape in some people, and I believe we all have the same structure there, just many of us (like most asians, and me) don’t show it. 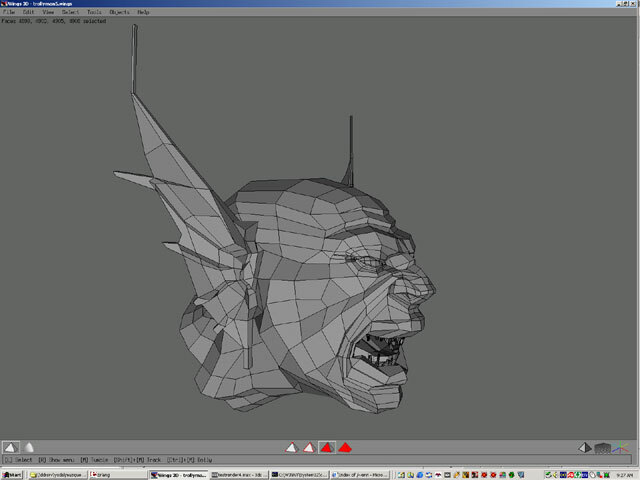 About triangles and 5-sided polys - in Maya what you see here works very well, never tried it in any other app. Steven- It’s always a good day when Stahlberg posts his wires. BTW, are those your level zero meshes for hierarchal sub’d? polymath- I see what you’re saying. I think in Maya’s sub’d, things kind of smooth themselves out when you get into finer smooths. But I’ll have to model this topology to see for sure. BTW, here are her “I’m going to kill you” face. I start all my heads from the same, generic, mid-stage control mesh, and apart from having less detail around the eyes (which are always extremely mesh-specific), and pr’aps slightly fewer loops overall (which makes it easier to achieve the proper volume by having fewer points to move initially) my generic model looks very similar to your image. Here’s a picture of the base head mesh that comes with XSI. It’s a pretty efficient base mesh. Yes, that’s right, those are the zero-level meshes meant to be turned into Subd’s. I think, Mr. Stahlberg, that you tweak your models after subdiv right? In that case, I guess nonquads don’t make much of a difference, since you can work with the quadified (?) smooth version. I don’t have a clue as to how to work like that in max. I guess it is of course preference for quads. I think we basically agree here then, Steve… You usually create quite idealized (beauty-type) faces, which conform a lot more to a general topology; and you also say that more characteristic features could require different loops. So those of us who have to build such models usually can’t benefit from generalized meshes that much. Regarding 3 and 5-sided polys, they will be converted to 3 and 5 quad faces at the first level of subdivision where you can easily smooth them out with hierarchical editing. But with straight polysmooth / nonhierarchical subdiv conversion we have to make sure that these faces will stay smooth, even during animation. 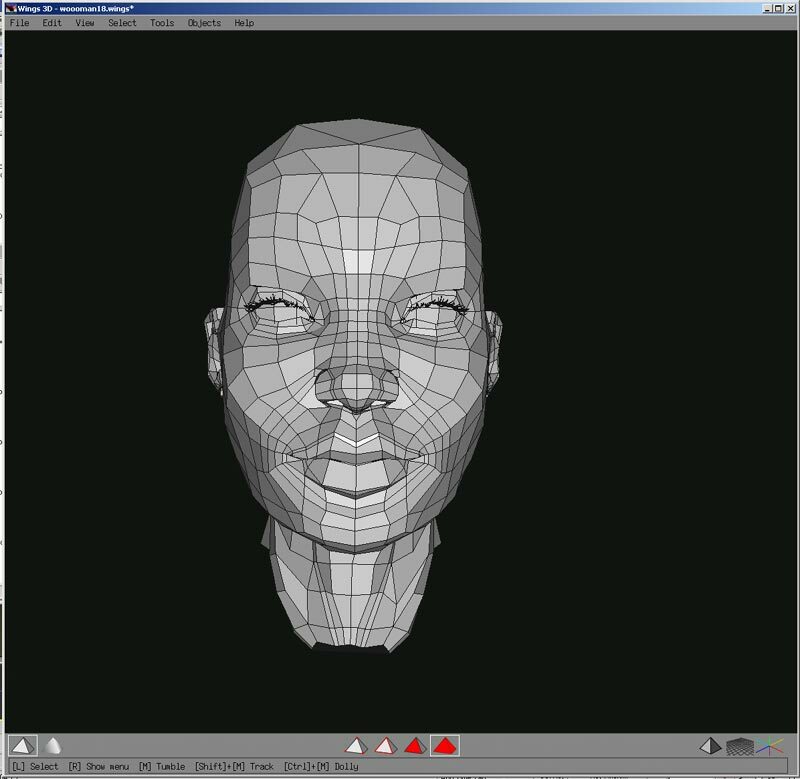 Here’s my latest topology for a face. I tend to reinvent the wheel with every face because I always want to explore new aproaches to getting the geometry down… It has tended to speed up my modeling (good practice) and taught me a few things. I try to avoid triangles except where thier shading wierdness actually helps. My experience tells me that they are a pain to deal with if used in a morphable area. i try to “push” them to areas where mirroring will double them or flat areas where they blend in well. it worked quite good for me, not a single tri so far. I love where this thread is going. It’s turning out to be the “gathering of good topology” thread. hello guys… i am scared to post in a thread with so many nice things. but i wanted to show my topology. both from the same head. there is very little difference between the 2 aside from the start of the childs hair, and the ears on the gargoyle. the mesh that i used to start them from isn’t all that good and i want to make a new one. i really feel it’s a great way to go. I’ve nothing basically to add since all meshes that will do the job are fine as far as I’m concerned. And of course I also tend to believe I’m using THE basic mesh. About which I do have a question. I’m using a loop (the extra one in the second picture) that starts on the nose bridge, circles the eye, passes the nose wing and ends up under the mouth. 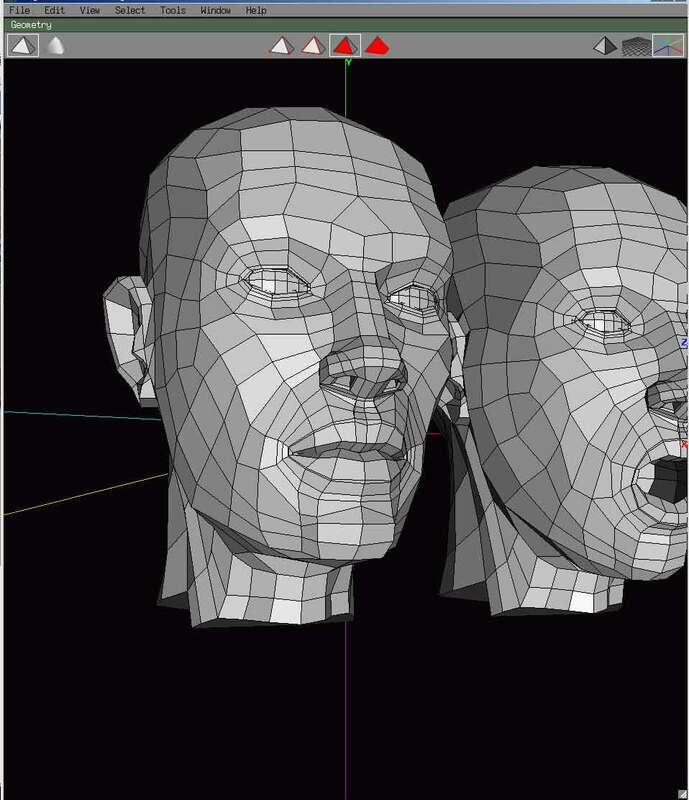 Here is a picture showing the UVW poly mesh left out the subs for eyes and mouth. I don’t think it’s a loop no one ever thought of before. So my question is how comes it’s hardly used, if at all? Just curious. …and two pictures done with it. Here’s mine. It’s light enough to be easily tweekable (and making it even lighter still, if need be, is as simple as selecting an edgerow and collapsing etc), but it’s complete enough that I don’t have to do the monkey work it takes to get to this point. hey guys thanks for posting the wires, this is really helpful, i’m learning loads, keep posting! The only reasson I can see why not to do that loop is that it might be hard to control the shape of the hollow at the base of the nostril when posing it for blend shapes… BUT I do like how it organizes the geometry of the cheek.